Why not ^^ Pin This ^^ for later? I have been self-employed for three years now. I started my social media consultancy off the back of this very blog and what I'd learnt while building this small corner of the internet for myself. The business was born out of a need to contribute some income to our household after 18 months on maternity leave from my full-time teaching position of 7 years. I knew it was a job I couldn't (and didn't want to) go back to: I had been unhappy in that job for the final year and a half, and it was clear to me that the hours, commute and salary were never going to be harmonious with my new family. 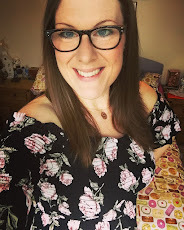 Social Media Management was something I'd been contemplating for a while, friends had suggested it would be a smart career-move for me...and so with nothing to lose (as I was currently unemployed and being a full-time stay-at-home mum) I took the plunge, said 'Yes!' to my first offer of work... and started spreading the word and networking. I can write more about HOW I set up my business and established my client base another day, if you're interested. But today, I want to focus on what I have learnt from working at home for myself over the past three years. And share some tips and advice on how to stay sane, organised and productive when you work at home. Especially if you are also a parent. Before I share the tips, let me give you a little more insight into my situation... I am 31, and live with my husband of 6 years, our two children: Bert, who is almost 5 and Connie, who is almost 2, in a three bedroom house in Bedfordshire. My son Bert goes to school full time and Connie is at home with me full time, with no regular childcare at all. I work around family life. The majority of my work hours are during Connie's daily nap-times (2-3 hours per day), or when my husband is at home to take over with the kids (early evening or weekends). It has been this way since I started the business three years ago...since then I haven't taken any extended holiday to speak of, except the odd weekend/long weekend. I didn't even really take any maternity leave when I gave birth to Connie a year into my business...this wasn't easy, but my work is something that I can keep ticking over from just my mobile phone, if necessary. Plus, I can schedule clients accounts in advance, if I know I need to not work on certain days/weekends etc. So when I had Connie I worked doubly hard in the weeks leading up to her birth to ensure my clients accounts were scheduled ahead, taking some of the pressure off. It certainly hasn't been all plain-sailing, and I be no-means have the perfect balance...some weeks I think "Yes! I've got the hang of this, this week the balance is right! ', and other weeks I have genuinely cried with tiredness, frustration, guilt, boredom, and overwhelm. 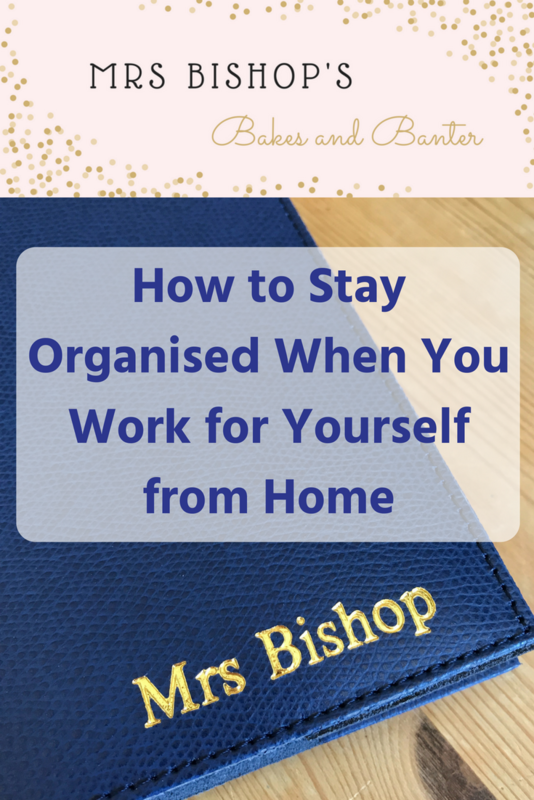 But, this aside, I have learnt on the job and made changes to my routine, to HOW I work, in order to address issues as they've arisen: and in that process I have found ways to make working from home easier and more balanced. This isn't always that easy or do-able for those living in houses with limited space, but I would highly recommend having an office to work from. 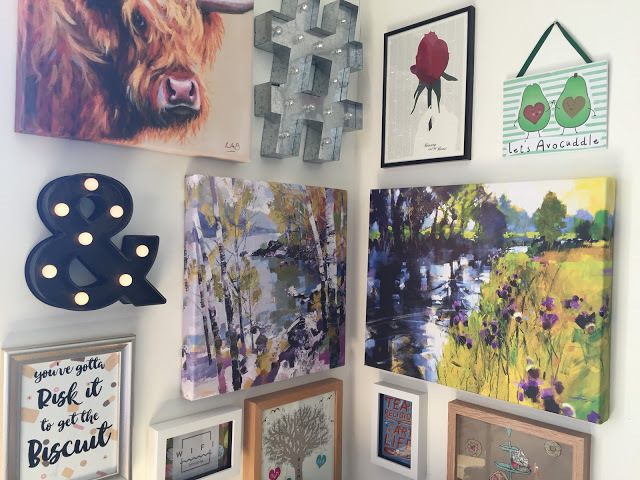 A space which is exclusively yours - not just the kitchen table/breakfast bar, not a shared desk with your husband or kids, not just your laptop on the sofa... a bonafide you-only workspace. Not only will it help you stay organised physically - but mentally too - entering your 'work environment' that is separate to your home environment will help flick the 'work time' switch in your brain - making you more focussed and productive. It is also worth noting here, that if you can make this working environment pretty, stylish, a 'happy' space, then you will enjoy your time working in it even more. If this isn't possible then at least work on keeping it tidy and organised. Have a space for everything. Tidy your desk at the end of every working day, have a really good filing system in place and keep on top of it. All of this will absolutely boost productivity and lessen procrastination. I'm very lucky to have a home office, just off of our kitchen/diner - it is exclusively my workspace and there is plenty of room for all my work-based needs. This loose schedule gives me a realistic idea of when I can work and for how long, it gives me set time to do the most pressing parts of my daily to-do list, and allows for overlap and change, especially on busier working weeks or when family commitments need more time than usual. I also always know there is flexibility to be had - I can get up an hour earlier to work in peace, if needed, or go back to work once the kids are in bed. I can add in extra housework, or sack it off completely if the kids need me instead. Flexibility is key when you work from home with children. Also, vitally, it addresses balance - within my daily schedule I set aside time for work but also for quality time with the kids, housework, socialising, cooking, exercising, time with my husband and time to myself. I don't always fit it all in, but I'm certainly much more likely to by thinking like this. I will note here that I genuinely know that I do not get enough sleep: this is something I am trying to address, but it is hard: years of being a night owl makes it very difficult to break the cycle. I genuinely don't want to give up my 'me time' late at night. I often don't go to bed until 1am and I know that for my health that isn't the best...still, there's always room for improvement and at least I know this is an area I must try to work on. I thrive on a to-do list. I have lists coming out of my ears, but they really help me stay focussed, on-task, and they help me to prioritise. I write a weekly to do list on a Sunday night, a daily to do list each morning and I have a monthly list of my commitments per hour to each of my clients, to ensure I can fit everyone in. I get a lot of pleasure from ticking off each item on my list and there is no better feeling than a fully completed list at the end of the day/week/month. I keep my daily list on a notepad at the side of my laptop, my weekly list in my in-tray to glance at whenever I need to and my monthly list is attached to wall of my office for a constant visual reminder of what I'm working on/aiming to achieve. 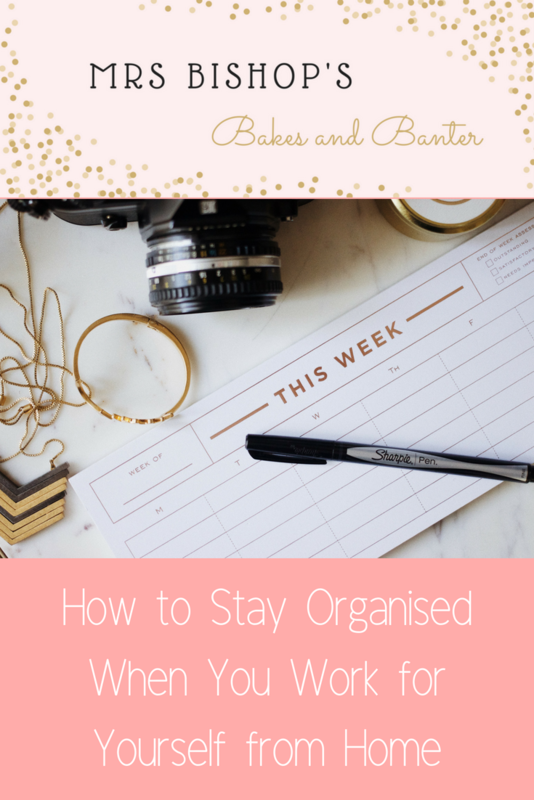 This probably goes without saying, but staying physically organised for me is absolute key to making my business work. I juggle multiple clients on a daily basis (currently 9 and counting...) and so I have to ensure I keep my working environment well-organised: this includes a notebook for each client (I'm a pen & paper girl and a self-confessed stationery addict, despite being a social media manager!) and then I keep separate virtual folders for each client within a Dropbox account online, which again, are all organised into sub-folders, so that I can access things quickly and easily. Wipe clean monthly schedule/calendar, along with a framed print out of my main client colour codes for graphics work, all visible from my desk as I work. 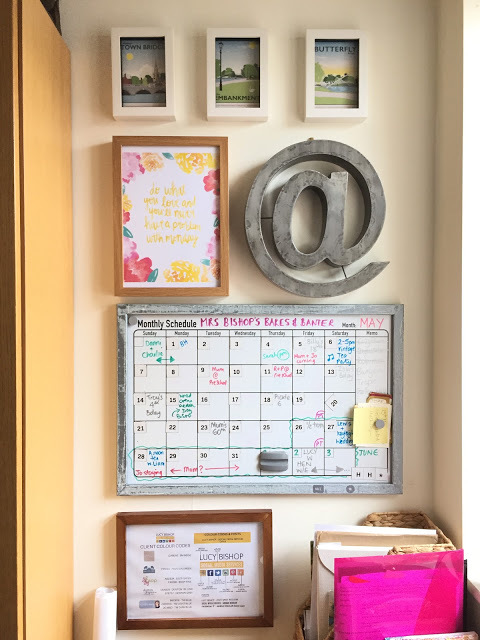 I have a monthly wipe-clean whiteboard calendar on my office wall, which I fill out on the first of every month with all our family and work commitments across the month - including social things, birthdays, work meetings/deadlines and a list of blog posts I need to get done that month. The whole family can access this board too and so it acts as a central calendar for us all. I have a 'main' notebook, which I keep daily notes, ideas, central business notes and figures in. This comes with me to every client meeting, along with the client-specific notebook and of course, my phone and laptop. 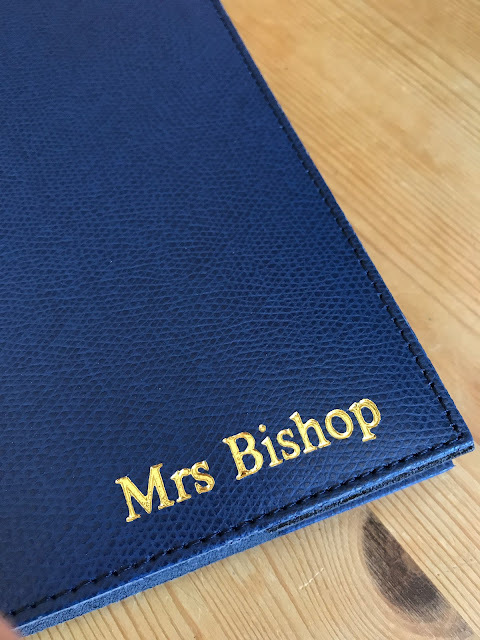 I usually get through one main notebook every 6 months - at the moment I'm using this absolute beauty from Pen Heaven priced at £48.90 - it is personalised with 'Mrs Bishop' on the front and is made from real leather. 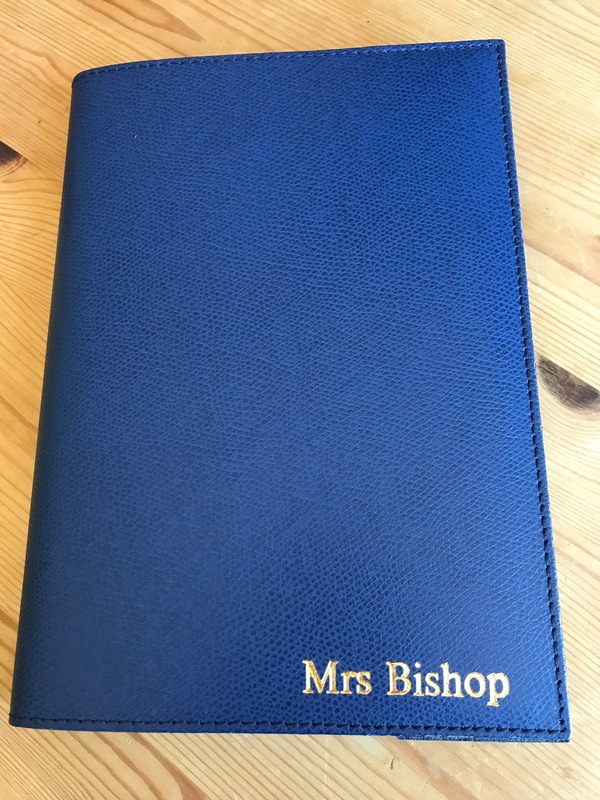 Best of all, it is refillable and currently contains an A5 lined pad. It is basically my work bible, and I couldn't function without it. I have learnt over the years that high quality stationery not only lasts a lot longer than budget items, but it looks more professional and helps me to be more productive (genuinely!) For me, it is absolutely worth the investment. 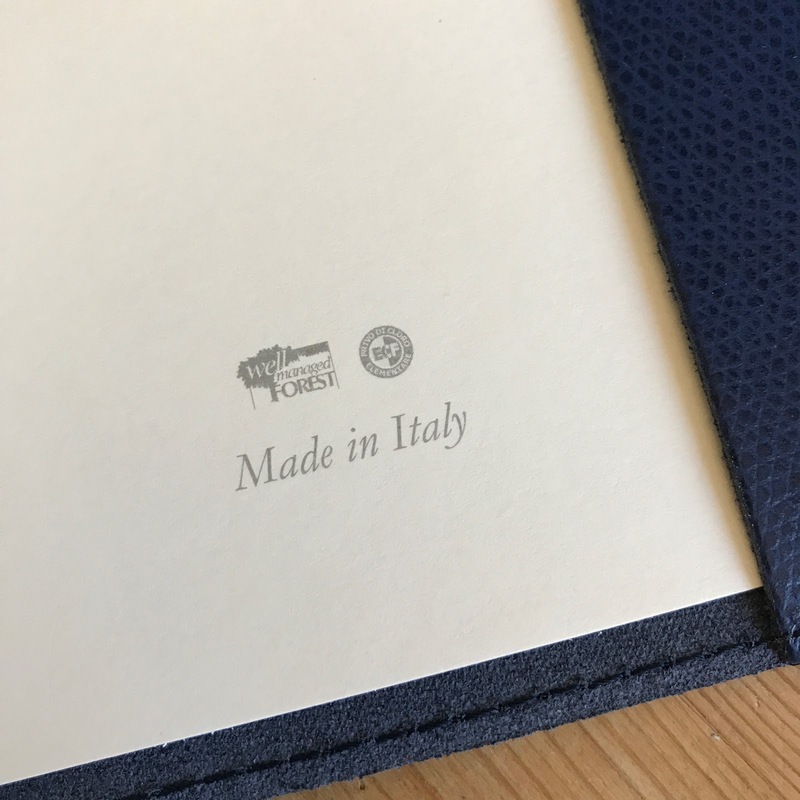 Especially something like this Palmi Large Grained Leather Journal which I will most definitely use and re-use for many years to come. This is a biggie for me and something I have had to learn over time. I am not superwoman and there are only so many hours in the day. Some days I start out with the best of intentions and then life just happens and everything goes out of the window. I do not beat myself up on those days...if the to do list remains untouched, or I don't get through as much as I had hoped, I try not to dwell on it. And simply re-evaluate the next day, prioritising the most important things at the top of the next days list. It is worth noting here that I try to strike a balance between prioritising work that has the most financial benefit with work I enjoy the most...which aren't always the same. My business-head tells me to do the highest-paid work first, for it to be the priority, but my heart wants to do what it loves first...so I try where I can to balance this... and create space for both at the top of the list. Ultimately, I have learnt to be realistic about what I can achieve and not over to over-commit, or promise to do/achieve things that aren't realistic for me. Firstly, I joined a gym. My hubby and I sat down and discussed when in our weekly schedule I could realistically fit in a workout. I have now been going twice a week for over a year and it makes me so happy - it is my down time, my escape and obviously is also brilliant for my physical and mental health too. I started using a HydrateM8 water bottle every day to ensure I was staying hydrated and not just living on coffee. It has become part of my daily routine without having to think about it. I usually drink around 1.5 - 2 litres of water per day. I began planning my working week lunches (usually on a Sunday along with the weekly evening meal plan) and buying in quick and easy to prepare healthy lunch options, so that I would always have time to stop and eat a balanced lunch: I make myself stop for 15 - 30 mins each day, watching a vlog with lunch, or reading a few chapters of a book, listening to my favourite album etc. A definite and clear break from work. I always start the working week with a long power walk with my good mum friends - we head off straight from the school run on a Monday morning with our younger kids in their buggies and we walk a beautiful route around our town's stunning river/embankment. We catch up on each others weekends, let off steam, laugh and enjoy the beautiful countryside while getting good exercise. It is one of my favourite times of the week and always gets my working week off to a great start. I am home by 10.30am and still have time for a little housework or play time with Connie before my working day begins. This took a while for me to implement - I am notoriously rubbish at delegating and find it incredibly difficult to admit when I am struggling and need support, but over the past three years I have learnt that there is nothing wrong in accepting that you need a little help sometimes. Whether it is as basic as help from your partner around the house with cooking to childcare or whether it's employing a cleaner, social media manager (Hi! ), accountant etc ...whatever part of your working life that needs assistance, there is usually some sort of help and support you can get from someone. For me, my support network is my husband, mother in law, my own mum, sister and my good friends - ultimately, I know if I need their help (mostly with childcare) then they will be there for me and we can somehow make it work. I have client meetings on and off throughout the month, mostly they can be done from home in my usual working hours, but sometimes I need to go to London, or meet a client for coffee or lunch out and about and it is then that I will call on some help with looking after Connie - usually my lovely Mother in Law has her, and this help is absolutely vital to me running a smooth and efficient business. I do appreciate that I am so fortunate to have this incredibly strong network around me, and I know that I would struggle so much more to juggle family life and a business without them. I guess what I'm saying is, 'find your tribe' - whether it is family, friends, or people you can employ, you can find ways to lighten the load. It is not weak to say 'I need some help with this', it is realistic. When you work from home it is so very easy to get sucked into the quicksand of social media and emails. I make it a rule to check my emails at the start of my working day - working through them as quickly as possible, deleting trash, flagging important things that are going to take over 5 mins of work and quickly responding to/tying up those emails which will only take a few minutes to respond to. I do this again after an hour or two of productive work. And occasionally check again during the early evening and weekends, just to keep on top of things. I try hard to keep away from my personal social media accounts during work hours, as they can be a huge distraction...I might look over my lunch break, or after the school run...at times when it won't prevent me from getting on with the task in hand. Both of these 'rules' help to ensure that limited amount of time I have blocked out for work is as productive as possible. I also screen my calls during work time...only answering personal calls if I think they are going to be important and often letting work-related calls go to answerphone so I can make an informed choice as to whether I should deal with it then and there, or find some time later to return the call. Now this one isn't easy and definitely doesn't come naturally to me, but, I have learnt over the years that I am much more productive when I focus on one task at a time, instead of juggling and multitasking. This is where the to do list comes in. I try my hardest to work my way through my prioritised to do list in order, only moving on to the next thing when the one above is complete. Now obviously, this doesn't always work, but on the whole it's how I roll and it makes for much smoother working process and a lot less mistakes. This is especially important for me when I am dealing with clients multiple social media accounts, passwords, content - all their differing voices and personas. Wearing one hat at a time, I call it... Which client am I now? 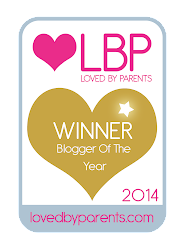 This one is a given for me, because of having to take Bert to school every day, but before the school run began in September last year, this wasn't something I did... often working in my pjs until 1pm, sometimes not even making the time for a shower until the evening when the kids went to bed and it made me foggy and sluggish - not as productive. If you can relate to any of this then I would hugely suggest trying a new routine where you get up, get showered and dressed, have breakfast and go outside for a walk (even just 15 minutes) BEFORE you begin your working day. Take the dog for a walk, take a power walk around the block, grab some groceries or a newspaper from the local shop, go out for breakfast, anything that gets you out in the fresh air for a little while. For me, my 'go outside' is the school run and often a walk with friends...but whatever it is, it will ABSOLUTELY make your work-time more focussed and productive and you will feel more put-together, professional and like you have achieved more in your day. Honestly, try it. This one may only apply to social media managers, or people juggling multiple clients, but where possible I try to record how I spend my work time - I set myself alarms for 15, 20, 30, 45 or 60 minutes on my phone, depending on how long I want to spend on a set task on my to do list, and I then try hard to stick to that time limit. I know in advance each month how many hours I have committed to for each of my clients, and this helps me to ensure not only that I give them those agreed hours, but that I don't over-deliver and end up working for free! If I am being paid to work for a client for 3 hours per week, then I try hard to stick to only giving them those three hours of my time. It is amazing how this can snowball and before you know it, you've spent double the time working on something without realising. I keep a note at the end of each work session of what time I've spent doing what, so at the end of each month I have a clear record of my hours for invoicing, which makes that process so much smoother and far less of a headache. This sounds like an odd one, but please, I urge you, don't make the mistakes I did at the beginning of my self-employed journey. I often hear people (mums/stay at home parents especially) joke about how they 'don't have time to be ill' and I get it, I do, it is a huge inconvenience, it means admitting defeat and asking for help and often means losing money, or allowing work to pile up - but please, if you are ill, I mean properly ill - if you know that had you been employed that you would have rung in sick and stayed in bed all day, then be kind to yourself and rest. Switch off from work, call in help with childcare if needed and give yourself time to recover. If you don't, you will burn out, your resistance will fall and you will continue to pick things up until your body forces you to stop. I've been there and it is not a good place to be. Talk to your partner/support network and ensure there is a plan in place for when illness strikes. Talk to other mum friends/WAH friends and be each others' back ups - you are only human and your customers/clients will understand this. The same goes for when your children are ill. You will need to drop-everything at times and that is not only totally normal, but also a major perk of working for yourself/running your own business. You pick your hours, so if you need to look after a sick child in the day instead of work, then so be it - you will fit some emergency work hours in late at night, or first thing in the morning and soon normality will resume once again. Let's be realistic, no one likes to think about tax, but don't let it creep up on you. Organise your invoices and ensure stay on top of them. I can hugely recommend Wave Accounting, an online accounting software which is free and is amazing for sending out invoices, keeping track of income etc if you have a quite straight forward cash-accounting business like mine. Set aside time at the end of every month to invoice your clients, follow up/chase unpaid invoices and file them sensibly, in 'the cloud' if possible, or ensure they are backed up. If your tax is more complicated with expenses, overheads, employees etc then I would definitely recommend paying an accountant to take on the majority of the workload, some charge as little as £30 per month, and it will be money well-spent, I promise. Ask other self-employed friends for recommendations. Estimate your tax bill each year, based on the previous years income and what your hours look like in comparison, and then divide that estimate by 12, and set up a regular monthly direct-debit for that amount to go straight into a savings account, so that at the end of the tax year you have the majority, if not all of your tax bill money to hand ready to pay. I would love to spend loads of time going to networking lunches, events, dinners, meetings, co-working spaces etc - but realistically, until both my children are in school full time this is not going to be possible for me. Networking like this can also end up becoming quite a financial drain, which doesn't always pay back - so if you do network physically then do your research, ask around for recommendations and try out a few different groups before committing financially to any (some ask for membership fees on a monthly, quarterly or yearly basis and you need to know the spend will be worthwhile for your business). There are however, absolutely LOADS of free online networking opportunities through social media such as Twitter, Instagram, Facebook and LinkedIn. 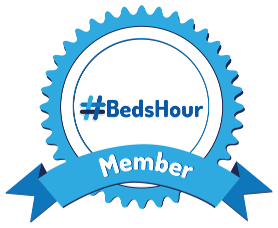 Try them out - look for your local networking hours on Twitter (we have #BedsHour on a Monday night from 8.30 - 9:30pm), find networking groups relating to your line of work, create your own WhatsApp or Facebook group with other friends who work from home for business-related advice, chat and support. By all means do a mixture of both, but ensure whatever networking you do is considered and ultimately, productive. - I have no commute, so no time is wasted getting to/from work, meaning more time with family. - I have the ability to pick and choose my working hours, so they fit around family life and can be changed as and when necessary. I can take them to school, pick them up, go into school during the day for class/school events like sports day or their class assembly. - I earn a good living so that they can have/do/wear/eat/drink nice things and we can enjoy luxuries as a family. This also takes the financial pressure of my husband, lightening the mental-load all round. - I am setting a brilliant example to my children; demonstrating a good and healthy work ethic and an understanding of how you can craft a career that works for you AND your family. This feels especially important to me having a daughter, I want her to see that when she grows up she can absolutely have a family AND a career she is proud of too, as can my son. I have learnt that my kids need to understand that sometimes mummy has to work - and they need to play together, watch a film, have some Kindle time, or spend time with other family members (Daddy, Nanny, Auntie) while I get things done. They are still being well looked after and nourished, but that doesn't always have to be by me. I understand that these times, when I need to work outside my usual set working hours are few and far between and although kids are brilliant at laying it on thick and making you feel terribly guilty for their boredom, it is vital in the long term that they understand A) what boredom is/feels like and B) how to combat it/amuse themselves. Life lessons right there folks! And so I am back to my original point at the start of this post - that you are only human, you do not have super powers and no matter how much you wish you could, you cannot magic more hours into the day. Instead, you need to be realistic, manage client expectations, be organised but above all be kind to yourself and remember all the many positives for working for yourself from home. Really interesting post, Lucy, thanks for sharing. So many similarities to my working practices (get outside before work, logging hours, using Wave etc.). Need to check out the water thing you mentioned - I drink way too much coffee! Thanks, Rob .